Upon entering a Masjid, a person sees a multitude of different people. Some of them he sees standing in prayer with their hands clasped together on the chest. Others he sees with their hands beneath the navel. Then as he proceeds further he observes one with his hands held together just beneath the chest. Following that he catches sight of a person who seems to be merely standing there. However, when he takes a closer look, he finds that this person too is engrossed in prayer, but he has not brought his hands together. instead he has left them at his sides. It is from situations such as these, where the questions arise, ‘Where exactly did Rasoolullah (Sallaho Alaihe Wassallam) place his hands whilst standing in prayer?’ The following discussion will seek to determine the exact Sunnah method of keeping the hands whilst in Qiyaam. However, before all else it should be borne in mind that the debate is not regarding one method being prohibited and another permissible or Fardh but, similarly to the issue of Aameen, this one is also only concerning which is the more preferable method of holding the hands together whilst in Salaah. Now moving on to the difference of opinions, it is worth knowing that there are really two different disputes here. Firstly. lmaam Malik’s (RA) opinion that one should leave his hands hanging at the sides of his body whilst in Qiyaam and he should not hold the hands together. As opposed to this other scholars have reached a total agreement that the hands must be held together and they should not be left loose on the sides. Stemming from this, the second group then have a conflict of views between them as to where exactly is the most preferable place for one to grasp his hands. Should they be held below the navel, beneath the chest or directly upon the chest? The problem is however, that there are very few sahih ahadith concerning this issue and most of the reports which express the different ways of keeping the hands have all been classified as being either totally weak or with some degree of defect in their authenticity. Due to the lack of authentic narration on this subject, it makes the issue slightly more difficult than the other issues of Salaah. Nonetheless, by the end of the chapter after sound analysis and reasoning the most preferable method which could also be designated as the sunnah one, will become evident. Following this dispute number two is regarding the exact portion of the body upon which the hands should be positioned after locking them together. lmaam Abu Hanifah (RA) and Abu lshaaq Al Marwazi (RA) from the Shafi’ees assert that to tie the hands together below the navel is Sunnah. lrnaam Shafi’ee’s (RA) view is to lock the hands together and hold them beneath the chest according to the books, Waseet and Kitabul-Umm (books on Shafi’ee fiqh). This is also Imaam Shafi’ee’s (RA) most popular opinion and the one followed by his school of thought. A second and more unusual view of his is that the hands should be situated directly on the chest. This is mentioned in the book Haawi. As for Imaam Ahmad, he holds three different opinions: One is similar to that of lmaam Abu Hanifah (RA) – lbn Habeerah has said this to be his more popular opinion. The second opinion is the same as lmaam Shafi’ee’s (RA) view and the third is, the Musalli has a choice between placing them beneath the navel or on the chest because both of these methods are derived from ahadith. Ulama state that there are no sahih ahadith which could substantiate lmaam Malik’s opinion of leaving the hands to remain at the sides. Some have stated the reason for him holding that opinion, to be absolute fear, awe and reverence of Almighty Allah; that once a person is stood before Him, he forgets to bring his hands together and they are left to hang at the sides. Whatever the case maybe, they do have a few reports which outline some Sahaahah leaving their hands hanging loose whilst in the standing posture of Salaah. 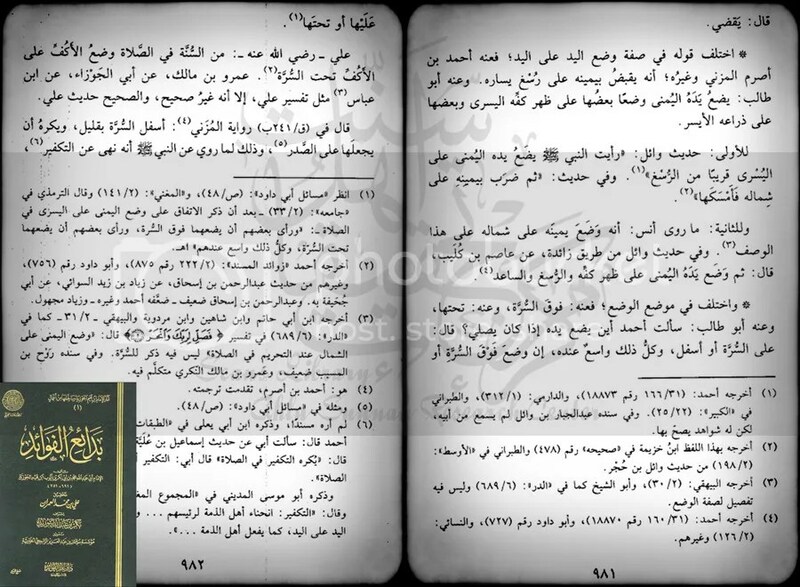 Although these reports are not mentioned here, they can be found in the book Musannaf-Ibn-Abi-Shavbah. This particular report is from S’ahih-Ibn-Khuzamah. The version mentioned in Musnad-ul-Bazzar instead of the term. ‘upon his chest’ has the words. ‘near his chest’ and the one found in Musannaf-Ibn-Abi-Shavbah contains the statement. ‘beneath the navel’. 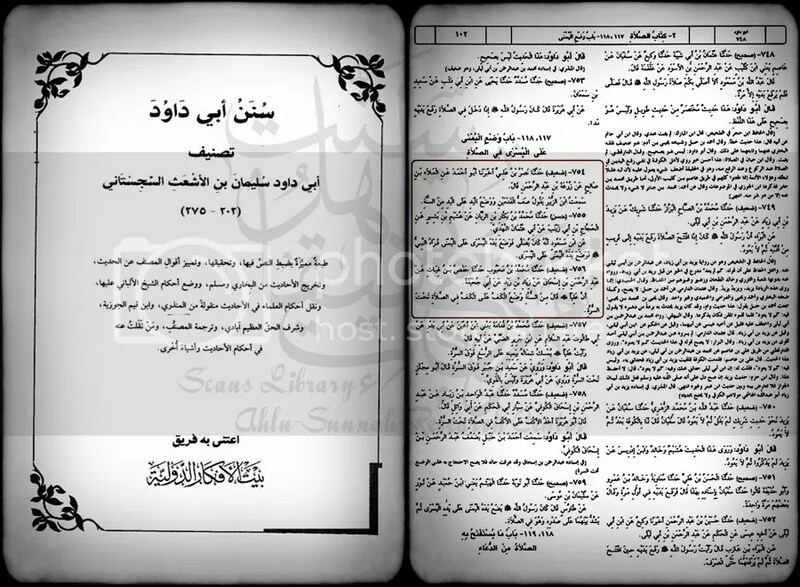 The first two reports, apparently establish the Shafi’ee’s point of view and the third one is in favour of the Hanafi’s opinion. It should be remembered, however, that all three reports do contain some type of a weakness or another, therefore, they will all have to individually undergo an analysis in order to deduce the reasons for the weaknesses and their levels. Furthermore, can any of the three stand as evidence or not, will also be determined. (ii) This same hadiih. although mentioned in many other books of ahadith, through various chains of narrations does not contain these extra words (on the chest) in any other one of the transmissions. This indicates that the narrations which contain that statement are only narrated through Muammil Ibn Ismail, who has been proven to be dha ‘eef. Adding to this. Allamah Nimwi presents the same narration in his book through Abu Daud. Nasai and lbn Majah. It is also found in the Musnad of Abu Daud At Tayalisi. but none of them have any transmission which contains these extra words. ‘On the chest’. (iv) Sufyan Thawri (who is mentioned in the chain of transmission) held the opinion of placing the hands beneath the navel thus, when his narration is found to be on the contrary, it will not be accepted. according to the rules of jurisprudence. (v) All the ahadith of S’ahih-Ibn-Khuzamah are asserted by some to be sahih. but this claim is not entirely true. Allamah Suyuti (RA) has stated in his book, Tadreebur-Rawi, that S’ahih-Ibn-Khuzamah also contains weak and munkar (disowned) reports. 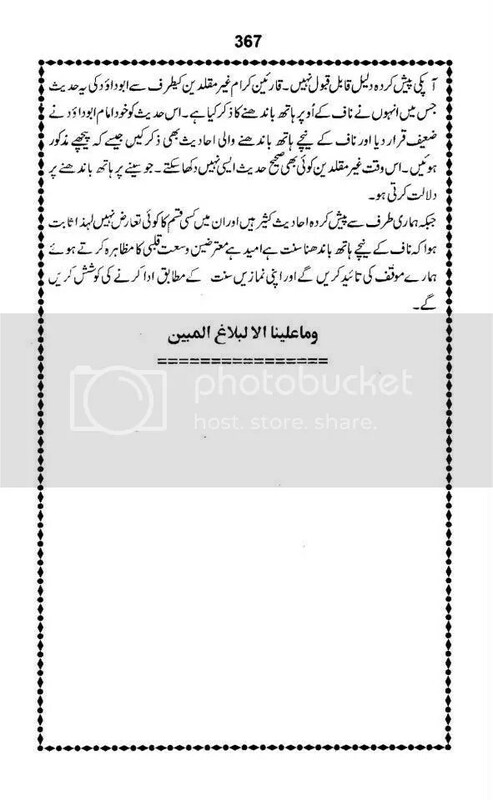 Furthermore, lbn Khuzaymah similar to Imaam Tirmizi routine comments on every hadih, designating their level of authenticity but, following this hadith, he does not make any statement whatsoever. 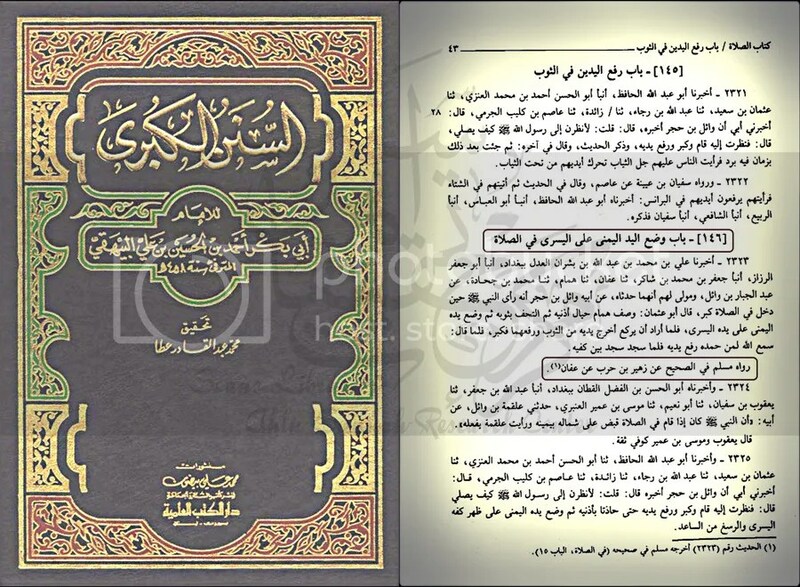 Therefore, because lbn Khuzaymah has remained silent regarding this hadith, it will not be classified as sahih due to it merely being part of his book. It is also evident that if it has been sahih it would surely have been designated as such. (vi) Even if this hadith be accepted for a moment then we could say, the reason for Rasoolullah (Sallaho Alaihe Wassallam) placing his hands on his chest was merely to inform the Companions that this method is also permissible (Bavaanan-lil-Jawaaz). In no way can one prove from this hadith that this was also done by Rasoolullah (Sallaho Alaihe Wassallam) on a permanent basis. 2. The second narration which is found in Musnad-ul-Bazzar containing the words. ‘near the chest’ is also weak. This is because it has Muhammad lbn Hajar (2) in its chain of transmission regarding who lmaam Bukhari (RA) says. ‘His matter is unsettled’. lmaam Zahabi (RA) states, ‘He has some disowned narrations’. Thus, this version will also be rejected due to being da’eef. 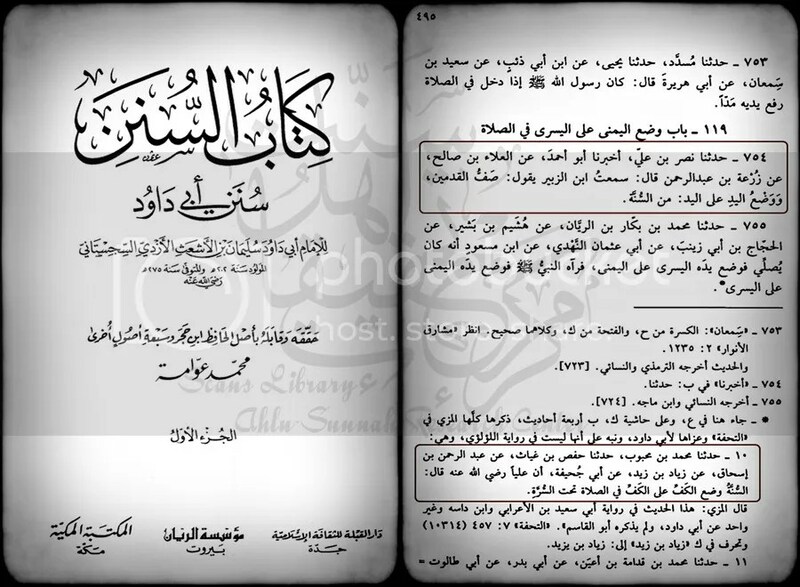 Allamah Nimwi (RA) has proven with strong evidence that this hadith contains a written error. In place of the words ‘on the other hand’, somebody by mistake inserted the statement. ‘on his chest. Thus, this hadith will also cease to stand as evidence for them. Up until now two narrations have been analyzed and they have both been found to be defective. Besides these, there are also others which contradict the Hanafi ‘s point of view. Thus, a general answer and reason for any apparently contradicting ahadith is that it is acceptable that Rasoolullah (Sallaho Alaihe Wassallam) did one at time or another place his hands on his chest or below it. However, the Hanafis assert that the hands were only placed in that manner to announce that methods permissibility (Bavaanan-lil-Jawaaz). The normal and routine method of Rasoolullah (Sallaho Alaihe Wassallam) however, was to place them below the navel (as will be understood in due course). This is a variant version of the two ahadith mentioned above which contain the extra words. ‘below the navel’. 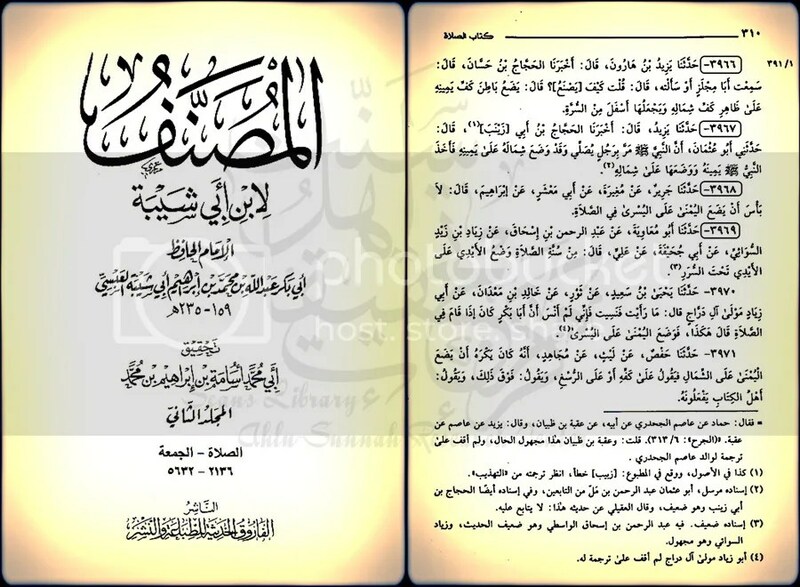 Regarding this hadith some Hanafi scholars with all fairness confess that it cannot be used as strong evidence to reinforce their view, because the extra statement (below the navel) is only to be found in some editions of Musannaf-Ibn-Abi-Shavbah and not in all of them. Also this hadith has an inconsistent text, because it also has the words. ‘upon the chest and ‘beneath the chest’ in place of ‘below the navel’ in some variant narrations which have been mentioned earlier. However. it is stated in Fathul-Mulhim which quotes from Aatharus-Sunan that Allamah Qasirn lbn Qutlubgah (RA) has established that this particular version has a good transmission. 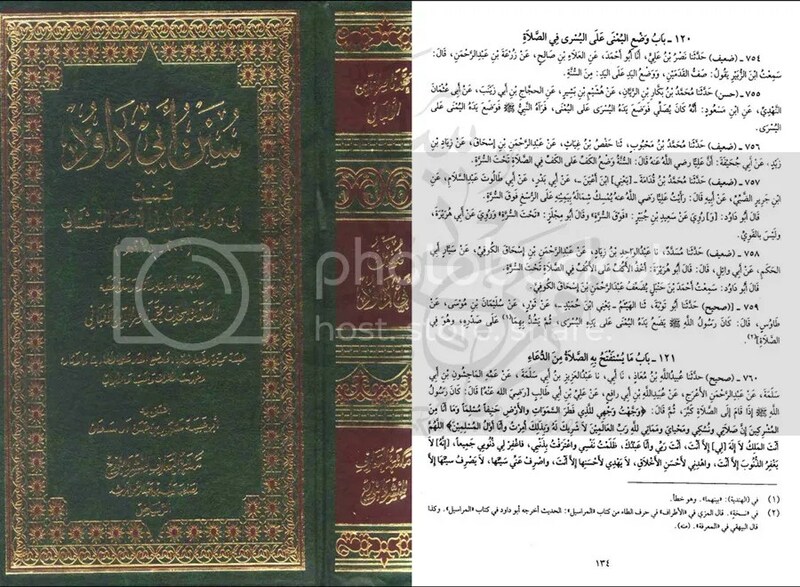 Allamah Muhammad Abut Tayvib Al-Madani (RA) writes in his commentary of Tirmizi, that this hadith is strong as regards to its transmission and Sheikh Abid Sindhi (RA) confirms. ”Its narrators are trustworthy”. Whatever the case may be the weaknesses of the hadith will not render it totally unacceptable because there are many other reports which supplement and strengthen it as will follow. It is a known fact that whenever a Sahaahi utters the words. ‘It is from the sunnah.’ They mean it is being directly reported from Rasoolullah (Sallaho Alaihe Wassallam) himself. However, the hadith does contain Abdur Rahman lbn Ishaaq in its chain of transmission who is classified as weak but the narration will be still accepted as supplementary evidence, because there are also other reports which reinforce it. 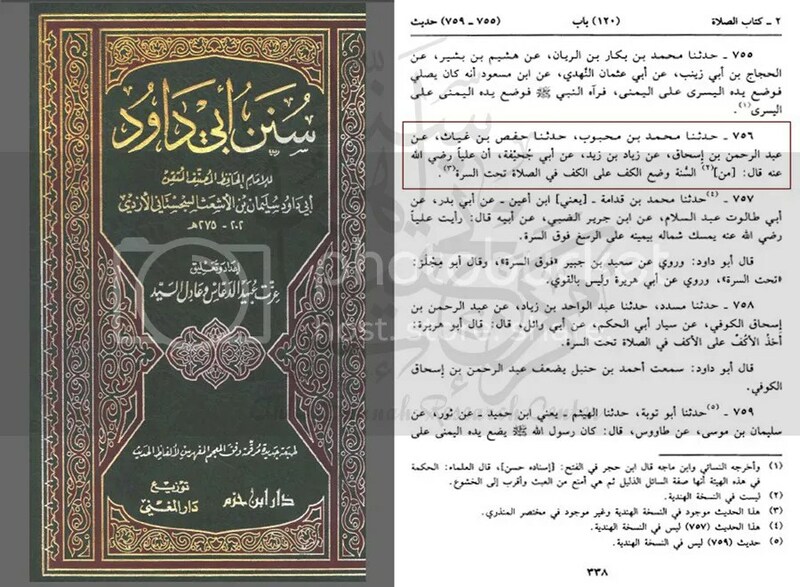 The transmission of the hadith is hasan as Allamah Al Maardini (RA) states in his book Al-.Jawharun-Naqi. The transmission of this hadith is also hasan. 1. Although the ahadith of all parties involved in the dispute detailed above, have some amount of weakness. the narrations used by the Hanafis have relatively received a lesser amount of criticism from the rest due to this reason, they will acquire greater approval. To conclude the whole discussion, it could be said that although, all the ahadith which are presented as evidence by each school of thought, contain some sort of weakness or defect, the ahadith of the Hanafis have a relatively less amount of criticism directed at them and they also have other reports which are quite strong to supplement those weak ones. The ahadith of the opposition (as detailed above) have been concluded to be unacceptable in backing their opinions concerning this issue, and the reason for their non- acceptance has also been detailed. To place the hands beneath the navel as it has been mentioned. engenders a greater amount of respect and humility. Also just as the sitting posture of salaah which is enacted by a male differs from the method of the female, the place where the hands should be rested by both the male and female, will also vary. This brings about the conclusion that judging from the ahadith and by supplementing them with sound reasoning, the Hanafis have a firmer stand than the rest and the sunnah pose will be to situate the hands beneath the navel. Namaz Me Naaf Ke Neeche Haat Bandhna Aur Aahista Aameen Kehna Masnoon Hai. Aur Yeh Tariqa Hadees e Rasool Ullah SAW , Sahaba Rdh. Aur Tabien Rh. Se Saabit Hai.Chand Riwayaat Naqal Ki Jaati Hai. 3. Hazrat Abu Hurairah Rdh. 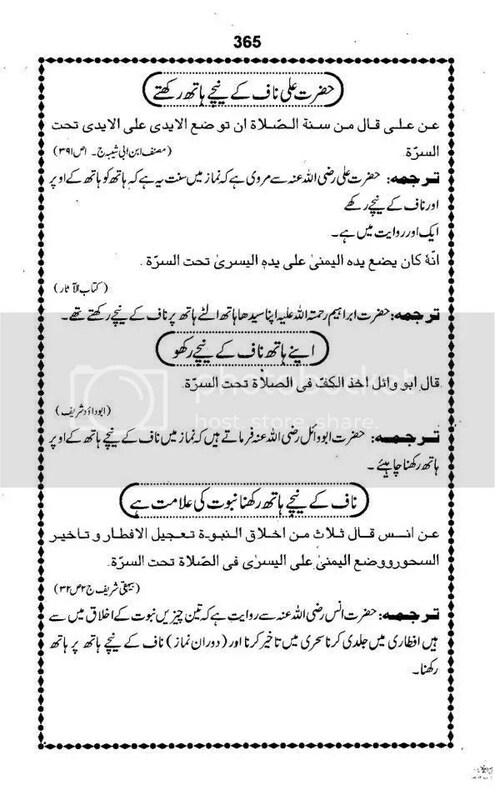 Ne Farmaya : Namaz me ek Hataili ko Dusri Hataili Par Naaf ke Neeche Rakhna Chahiye : (Sunan Abu Dawud : Safa 123 : Hadees 758 ). Muhaddis e Kabeer Alama Nawawi Rh. 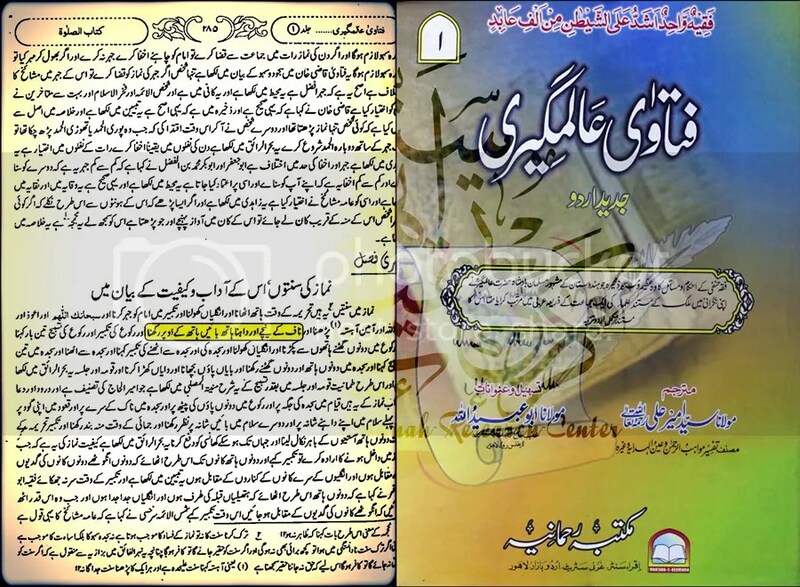 Farmate hai : Is Hadees ki Sanad Saheeh Hai. ( Asaar e Sunan 149). 5. 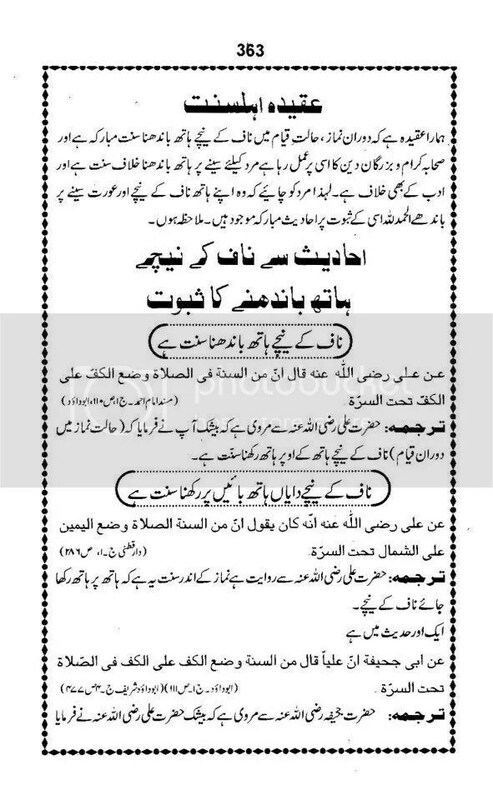 Jaleel ul Qadar Tabii Hazrat Ibrahim Naqi Rh. Farmate hai ke Namazi Namaz me Apne Daaye Haat Ko Baaye Haat Par Naaf ke Neeche Rakhe. 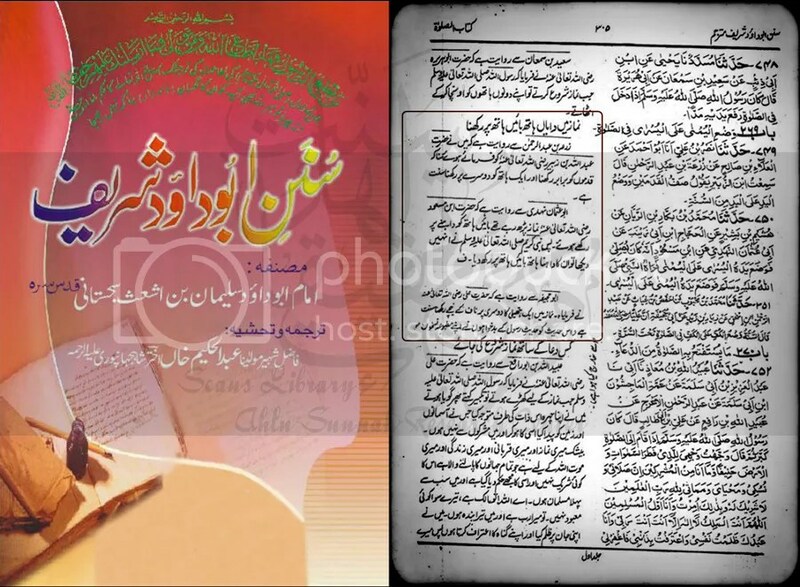 (Musannaf Ibn Abi Shaiba : 322/3 : Hadees Number 3960 ) Is Rivayaat Ki Sanad Hasan Hai ( Asaar e Sunan 150 ). 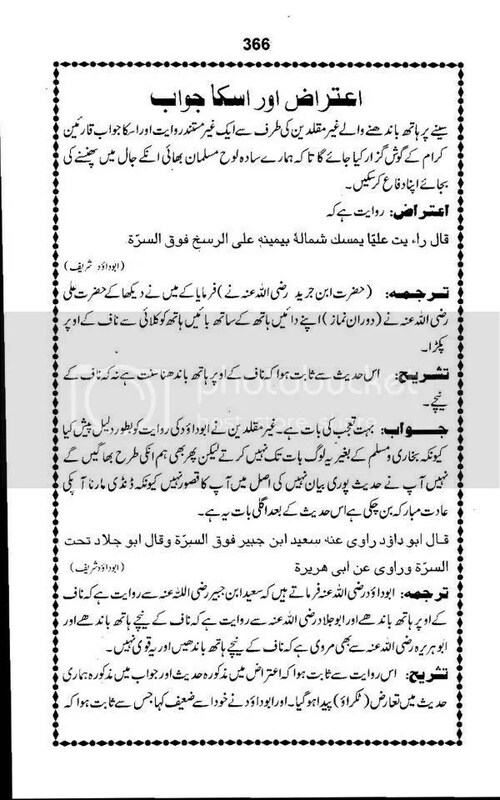 Muhaddis e Kabeer , Imam Ishaq Rh. Farmate hai ke : Tahtas Surrah Yaani Naaf ke Neeche Haat Bandhna Yeh Hadees me Zyada Qavi Hai aur Tawazo ke Zyada Qareeb Hai. (Al Ausat Li Ibnil Munzil: 94/3). Imam e Ahle Sunnat wa Jamat Ahmed Bin Hanbal Rh. Ka Mazhab. Imam ul Muhaddiseen Imam Trimizi Rh. ki Faislakin Tehreer. أبو داؤد، السنن، ۱ : ۲۰۱، رقم : ۷۵۶، دار الفکر ۳. As usual (the deviants) has removed hadith of Abi Dawood Sharif from their new publications, and in almost all places, covertly declared this sound hadith as “daeef”. Check the scans and marks to examine it. First those scans which are having this hadith! 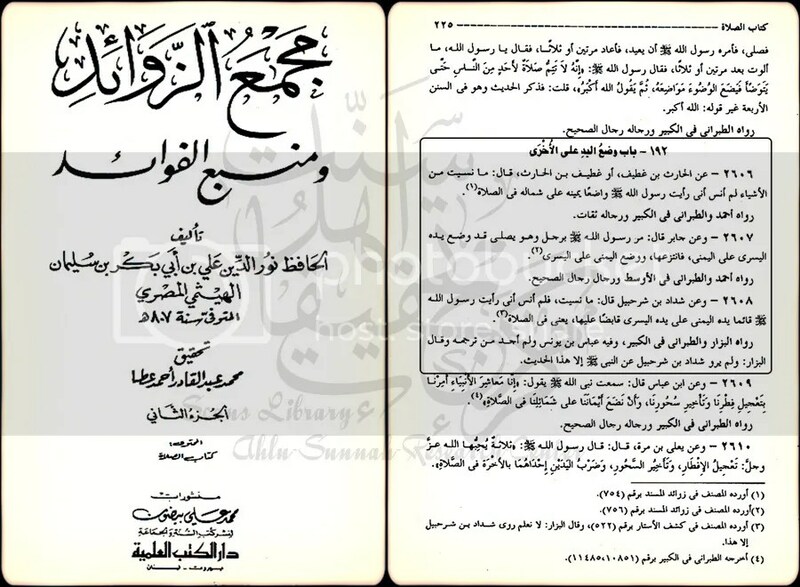 Sunan Abi Dawuod Dar Ibn Hazm Edition. Now in this Maktabatul Makkah version, Mosisatal Ryan Beirut version, and Darul Qibla version shows another way of game. 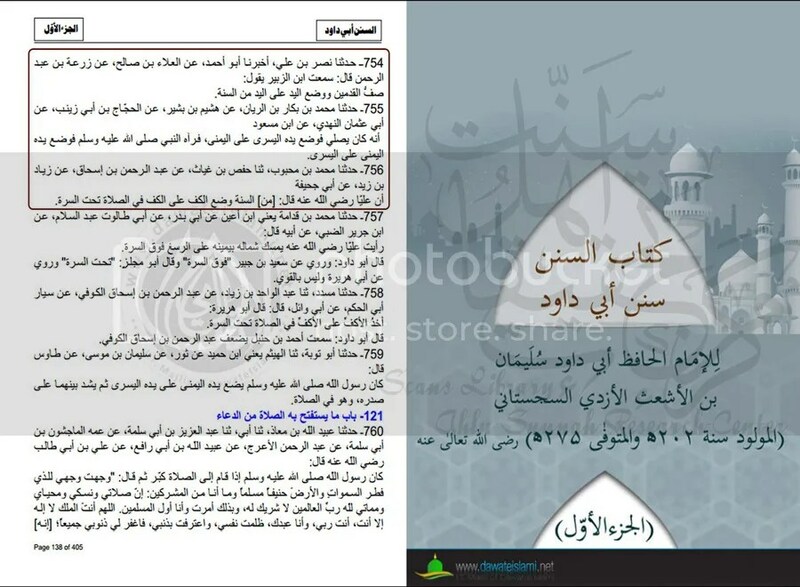 They are though showing hadith, but they had taken hadith number 756 from series and put it in Hashiya check it. Hafidh Nur-ud-deen Ali b. Abi Bakr b. Sulaiman .al-Imam Haythami al Misri in his Majma uz Zawaid Vol 2 Pp 225 presented authentic ahadith on this issue. The most authentic book of Fiqhi Issues, Fatawa e Alamgeeri also Proves keeping hand below the navel as Sunnah.